Released on 4 November 2016, as part of the 'On Air' deluxe 6 CD set only. 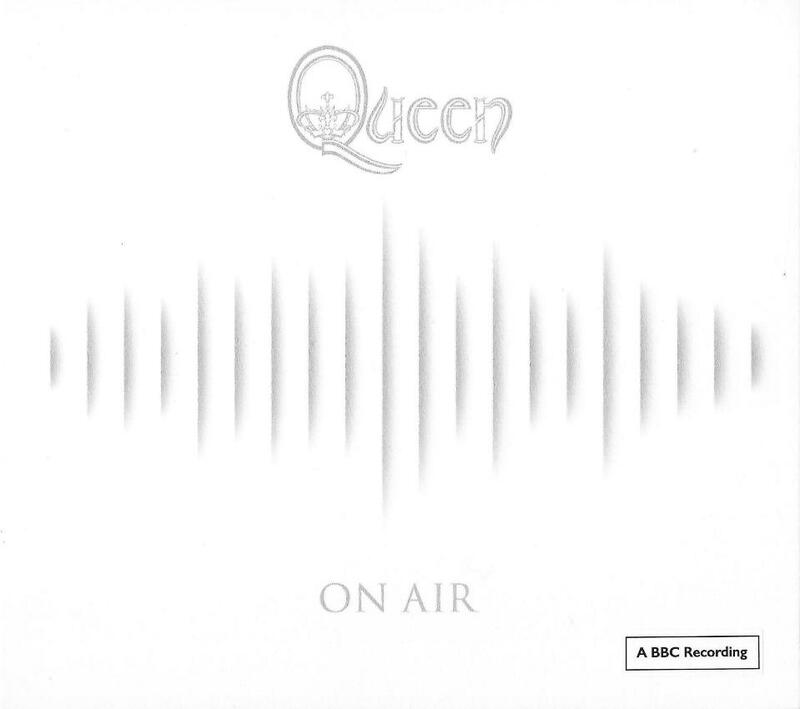 This page includes a transcription of all of the interviews which were released on disc 5 of the 'On Air' deluxe 6 CD set, which cover the period from 1981 to 1986. The set included two other discs of interviews, covering the periods 1976-1980 and 1986-1992, two discs containing all six BBC Sessions, and a disc containing highlights of three live shows. Most interviews contain excerpts of tracks, which are shown in square brackets below. In general, these fade out shortly after the start, and then fade back in towards the end, rather than being full versions. This interview was broadcast in March 1981, and features an excerpt of 'We Are The Champions'. It begins with a radio tuning sound effect. Interviewer: Now the technical resources you've laid on for this, this tour, are just staggering, I mean for example you've got seventy five tonnes of equipment or thereabouts on stage with you, and you've even taken with you a full football pitch worth of astroturf, that plastic grass, what's that for? Interviewer: What's it been like standing on stage, you know, in Argentina, what's the atmosphere been like coming at you from the crowd? Tracks 2-8. Total length 11:05. This interview was broadcast in June 1982, is divided into seven parts, and features excerpts of 'Dancer', 'Back Chat', 'Put Out The Fire', 'Life Is Real' and 'Las Palabras De Amor'. John: Do you enjoy playing in the open air in this country? John: 'Dancer', a track from Queen's 'Hot Space' LP, which was released very recently. Brian, do you write a song like 'Dancer' with an obvious space for a guitar solo in it? John: The first track on the second side of the album, Brian, 'Put Out The Fire', what is the song written about? John: 'Under Pressure's on the album, and of course it was a number one hit, how did this collaboration actually come about? John: How was it written? I mean was it a genuine all five of you collaboration, or, or did one of you take the lead and? Tracks 9-13. Total length 11:43. This interview was broadcast in March 1984, is divided into five parts, and features excerpts of 'Machines', 'It's A Hard Life' and 'Hammer To Fall'. Richard: Why such a long pause between 'The Game' and 'The Works' then, eh? Richard: Were the batteries running a bit low then, for whatever reason? Brian: Kind of, did I really say that? Richard: Is this a pointer to the fact that maybe you are more individualistic nowadays, than, than being a group? Brian: I think we've gone through the worst of that, and it's an evil, you know we talk about all these things, which is probably the reason we're still together, we shout and scream at each other, but at least we talk, and we were aware that on the last, actually the last couple of albums, that it was so-and-so's track, and it didn't really, the others didn't get a look in, so that, that's another thing which, which was part of the evolution of this album, we consciously let the others in on the tracks, so that they would sound like Queen tracks, and there's a lot of arbitration. What was the question sorry? Andy: Interesting you talking about the guitar here screaming away in the background, I, I notice one of the big, one of the music papers in this country has got a, a great big thing about guitarists nowadays, and you're, you're still one of the great guitar heroes, aren't you still? Richard: Why didn't you ever put that into mass production? Andy: Have you changed it much over the years, your particular model I wonder? Andy: Is it a real, is it a real conflict I wonder, or, or just (Brian: well I don't think it needs to be) that novelty encourages people to write songs on new equipment, you know, sometimes? Andy: Was it always faded out? Richard: What's the involvement actually with the Metropolis idea, because I think they're reproducing a, a new version of that aren't they? Andy: And colour, isn't it, and in colour? This interview was broadcast on 15 August 1984, and features an excerpt of 'Hammer To Fall'. Interviewer: Tell us a bit about this solo album, will it bear any resemblance to a Queen album? Interviewer: The shows of course come to Britain within the next few weeks, does playing Britain mean anything special to you at all, or is just another big gig now? Interviewer: Are you actually looking forward to going out on stage and performing again? This interview was broadcast on 3 September 1984, and features an excerpt of 'Seven Seas Of Rhye'. Interviewer: Do you never feel the whole business about Queen touring has got a bit out of control, huge stadia, tonnes and tonnes of equipment, articulated lorries to take it everywhere, I mean it's very complex, it's not just rock 'n' roll anymore, is it? Interviewer: You of course are a hero to many guitarists throughout the country, probably throughout the world, but you yourself, who were your guitar heroes? Interviewer: What is it that stimulates you still to keep playing after all these years? This interview was broadcast on 15 September 1984. Graham: Inevitably, with the success that you've had, it's bound to bring a different lifestyle to yourself, do you find that then harder to relate to the average people that will buy the records, in the sense that now you're so much further on than when you were say twelve years ago, and in bedsits yourselves and very much on the breadline? Graham: Coming right up to date with 1984 and 'The Works' which has been an amazingly successful album for the band, would you say that, that really it's important these days to have success for anything other than personal satisfaction? Graham: Does have four writers within the band make life easier for you to decide what you're going to use on an album, or is it harder because you've got so much talent? Graham: How do you feel about recording these days, because not having, and I'm sure you don't have time limits on recording an album, or indeed a budget that says how far you can go, so how do you decide where to stop? Tracks 17-25. Total length 28:47. This interview was broadcast on three consecutive days in June 1985, is divided into nine parts, and features excerpts of 'Crazy Little Thing Called Love', 'Mr Bad Guy', 'Seven Seas Of Rhye', 'Killer Queen', 'Bohemian Rhapsody', 'I Want To Break Free', 'There Must Be More To Life Than This', 'Under Pressure', 'Love Of My Life', 'Las Palabras De Amor', 'It's A Hard Life', 'We Are The Champions' and 'Made In Heaven'. Simon: I'd ask you about that, because you don't like doing interviews, and you've said you don't like doing interviews like this, and I wonder why? Simon: Title track from the new album which is 'Mr Bad Guy' which was an album we focussed on quite a lot during the conversation. Now you heard that first part of the interview, and like me maybe you thought 'hello, this one's not gonna go terribly well', but we then had a cup of tea in my case, and a I think it was a vodka and tonic he was drinking in his case, and suddenly everything started to relax and we got on, I think, fairly well. Certainly the stuff you'll hear over the next couple of days is remarkably frank, er, we started though at the very beginning, because in the days before Queen, well what was he doing then? Simon: Did you think of it as a career? Simon: Was that what you were trying to do? Simon: Which was the song? Simon: Were you disappointed with that, I mean were you upset? Simon: Can I go back to the first promotional film, which was historic in the sense that you, you established something and the idea of the video, (a) where did the idea come from, (b) who the hell put the money up? Simon: Alright, I'm not asking you to be pompous now, but where you aware at the time that you were really setting a standard? Simon: When you saw the final clip, and you looked at it, and you laughed as everybody did, did you think it was the kind of thing that would be accepted by the kind of person who doesn't normally accept that sort of pantomime dame approach? Simon: Well working with other people, is that something you find hard, or, or do you enjoy it? Simon: What kind of things do you enjoy, what kind of movies do you enjoy, what kind of television programmes do you enjoy? Simon: Where would you like to go, what would you like to do? Simon: What would you eat? Simon: Do you go for the food, or do you go with company for the company and the food? Simon: Um, well despite those current health problems, despite partying, and the expensive restaurants, and the opera, and the ballet, and generally being a dirty stopout, Freddie looks incredibly good, ah, 'you look fit and young' I said, er, rather jealously, so how come? Simon: So is Freddie thinking of putting his feet up for a while? This interview was broadcast in July 1986. David: Playing live is one of the reasons that people want to be in groups, I know, I mean do you, do you, has your attitude changed at all from, from, I don't know, thirteen years ago, to live work? David: Absolutely. I'm as guilty as anybody in the media, or maybe a little bit less guilty than some, about passing on second hand information about Queen splitting, and I have since read denials in the press that you are not splitting, um, having first got the information from the newspapers in the first place that you were going to split, I mean, are you going to, are you gonna call it a quits at the end of this year as some people have suggested? David: It would be easy to say to any interviewer at any particular gig that this concert is special to you, but I know that Wembley is special to you, why is that?